I'm an antiques dealer specializing in vintage linens, lace and hankies. One of my favorite sources for finding merchandise has always been local tag and estate sales. Of course, not every sale will have vintage items and even if they do, Grandma's linen napkins and hankies are not likely to be mentioned in the limited space of a classified ad. 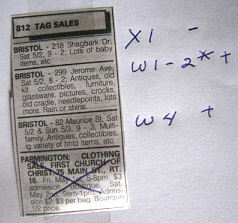 Suppose tonight's classified lists 30 tag sales for tomorrow. Somewhere out there are a few wonderful treasures (an embroidered linen cloth, cutwork table runners or pieces of figural lace). Where? How to choose? It shouldn't be a complete crap shoot. Some of the ads may be fairly accurate. Some ad-writers push your buttons; all promise, no delivery. The "beautiful baby clothes" sale may have Aunt Tillie's dirty old handmade lace off in a corner. Maybe the crap shoot theory isn't all wrong. You wish you could see all the tag sales QUICK! A vague plan, a wing and a prayer; one eye on the road, one eye out for signs (is that one new or last week's?). So NOT the way! Like a Boy Scout, "Be Prepared". This is a situation where doing your homework pays off.  There are two methods: the old fashioned paper-and-pencil method and the modern technology method. I think it works best to start with one and progress to the other. Red indicates steps and parts of steps that can be eliminated by using your computer. 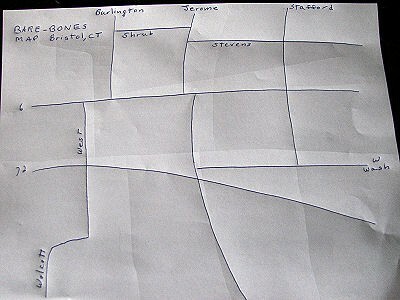 On unlined paper, make a bare-bones map of the main city routes and streets, leaving margins for street-names. Abbreiviate wherever possible. Take the time to make this accurate and neat as you will be making many copies, a fresh copy each time you tag the city. The store-bought map will have numbers and letters along its margins. These form a grid, dividing areas of the city into neat squares. The dot in the sample grid is in B3, the x in D2. All the city streets are alphabetically indexed in lists along side of the map. Next to each street are the co-ordinates of its location. 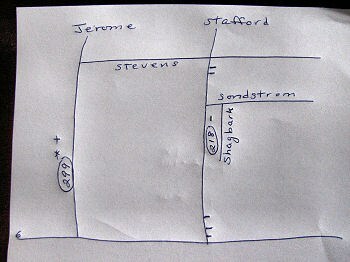 Thus, if Elm St. is marked D5; it will be found in the lower-right square. You may still have to do some looking but at least the search area is limited to a few square inches. Back to the tag sale list. Mark each address with its location co-ordinates from the map index and any reminder codes you deem important. Using your co-ordinates find each address on the folding map and transfer it to your bare-bones map, filling in small streets and turns only as necessary. In my example, Sondstrom (leading to the Shagbark sale) may be approached from two directions off of Stafford, either the second left south of Stevens or the forth right north of Route 6. Shagbark will be the first right off of Sondstrom. The little dashes along the edge of the street help me to keep track of how many and which side. Jerome, of course, was easy. However, Jerome stretches for miles and the number may be anywhere. Usually (but not always) low numbers begin nearest to the city-center and radiate outward. Circle the house number and add codes next to the circle. If you have tried this so far, you realize that it's a tedious process, and the most tedious steps are finding the street in the index and grid on the folding map. These two steps are exactly the two that your computer can blessedly eliminate. Thank You Google! Moving us into 21st century technology, Google has created maps.google.com. You type in the address and city. In one click Google displays a map pinpointing the exact location. The gadgets in the upper left of the map allow you to zoom out far enough to reveal the main connecting streets and move in any direction to check the turns you will need. The Google map will show pretty accurately where on the street the address will occur (helping to locate numbers on long streets, such as Jerome). When you have finished mapping, you may want to outline a tentative first-round route in yellow magic marker. Some tag-salers actually drive a dry run the evening before, especially if the territory is unfamiliar; say if you are vacationing. Tape the map to your dashboard. You're off! Good luck! I almost never follow signs leading to unadvertised sales; never if the sign is undated or doesn't show the exact address. If they had good stuff, they would have maximized buyers by listing the sale. Usually signs take you out of your way and waste your time. Don't take opening times too literally; some sellers welcome buyers during set-up; some feel you are criminally trespassing at five-of. Assume you will retrace your territory several times according to scheduled openings. It is better to re-do parts of your route than to explore a new area; at least you will know which sales have already been picked over and which have just opened. Keep back-tag-sale lists. Many people have several sales each season. Some of those are semi-dealers, coming up with the goods time after time. Some are just trying to sell the same old junk over and over. You need to know which is which.